ETC’s Selador Desire line of luminaires changed the way designers think of LED lighting. Unlike the digitised, artificial look that LEDs were known for, Desire luminaires produce high quality, beautiful light that even the most exacting designers can put front and centre in their designs. Desire fixtures have made their home in indoor and outdoor applications for theatre, architecture, touring and broadcast. And now even more venues can have superior lighting, with the introduction of the D22 luminaire, which packs the power of the Desire line into a miniature footprint that fits any design and any budget. Thanks to the début of the D22, the Desire family now includes three sizes of LED luminaires to cover every lighting task: the ultra bright D60, the versatile D40 and the compact D22. Later this year, ETC will add a fourth D22 array, Studio HD, which produces high-definition white light with variable colour temperatures. The Desire line offers solutions for temporary and permanent applications, and there are D22 versions for both. 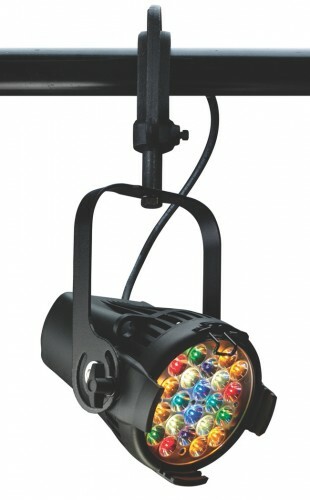 The canopy mount and track mount D22 models are reliable and durable, providing spectacular light over time. “The Desire family’s easy setup makes the portable D22 a smart choice for short term projects, for busy venues with constantly changing light plots, or for adding the last striking detail to a lighting look,” explains Armendariz-Kerr.